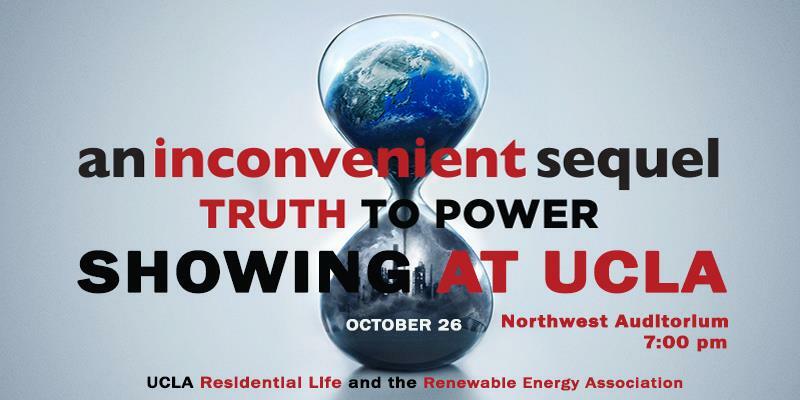 Renewable Energy Association at UCLA is proud to partner with UCLA Housing to take part in a national screening event of the newly released An Inconvenient Sequel: Truth to Power on Thursday, October 26th at 7PM in the Northwest Auditorium! An Inconvenient Sequel is a documentary about former United States Vice President Al Gore’s continuing mission to battle climate change, and addresses the progress made to tackle the problem and Gore’s global efforts to persuade governmental leaders to invest in renewable energy. **Even more exciting**, following the film we will be joining a live nationally telecasted Q&A with former Vice President Al Gore himself! Entry is completely free for students, so we hope to see you there!